As young children, we are encouraged to think about what we want to be when we grow up; fireman, astronaut, ballerina. Certainly, no child says, “I want to be an accountant,” for a seven-year-old has no concept of an accountant, a physical therapist, or a book editor. Then after 10 or 11 years of schooling, we are pushed to make choices around our career that will have long-ranging effects far beyond what we can comprehend at this age. Sometimes our choice works out for the best and other times, it creates a kind of prison for us. Now we spend more time working than with our families. What we do should bring us satisfaction. It should stimulate our imagination, encourage our creativity, in addition to compensating us appropriately. If anyone finds themselves at a point where their work is sucking more energy than it ever gives back, never be afraid to rethink your career or vocation. Don’t let how much time or effort changing your career will require deter you from pursuing your dreams, the time will go by anyway. You owe it to yourself to seek that which will fulfill you. If you are moving towards your dreams, your soul will feel alive. 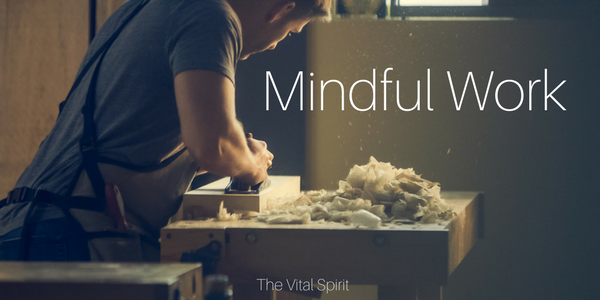 When your soul is fed with mindful work, life becomes a much richer and deeper canvas. Engage your Heart, Ignite your Spirit!